My son and I are working on a little scrap sewing project. The first step of our project was to sort through all of my bags of scraps. (My scraps are currently housed by color in gallon zip lock bags.) It's a bit of an "I Spy" project, so we wanted to pull any interesting scraps that had fun pictures on them. In a few cases, we pulled a piece of interesting fabric from my stash, like those awesome giraffes that I haven't used anywhere yet. We're piecing them together in monochromatic blocks which are rounded out with any other scraps in that color. You'll see from these scrap blocks that the majority of my stash (and scraps) are blenders, so most of my fabrics read as one color. I had previously finished an orange block. In the last couple days my son (age 8) has been itching to sew. He picked out some of the yellow and green scraps, trimmed and created the layout of each block and did all the machine sewing to piece these blocks. I assisted by pressing seams and trimming edges where necessary to have a straight edge to sew. These blocks are each 8 1/2" unfinished. I just love working with scraps from previous projects. The orange butterflies are from an Pretty Ditty Apron I made as a gift last year. 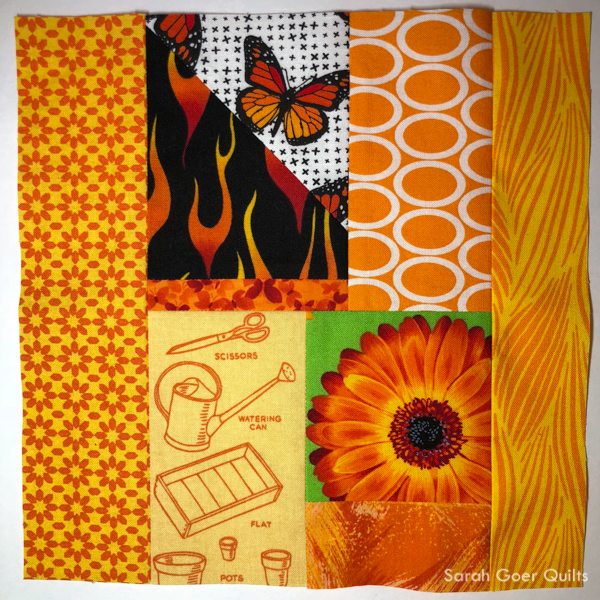 One of the orange blenders was from the Midnight Mystery quilt. 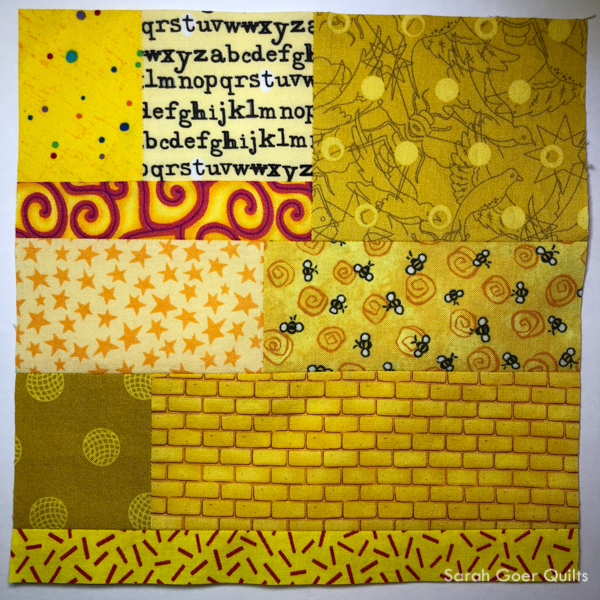 The yellow alphabet fabric was from the Text Me swap I participated in. A couple of the yellow fabrics were scraps from one of my favorite early projects, Candy Shoppe, and the yellow brick fabric was used on the Wizard of Oz quilt I made for my nephew. 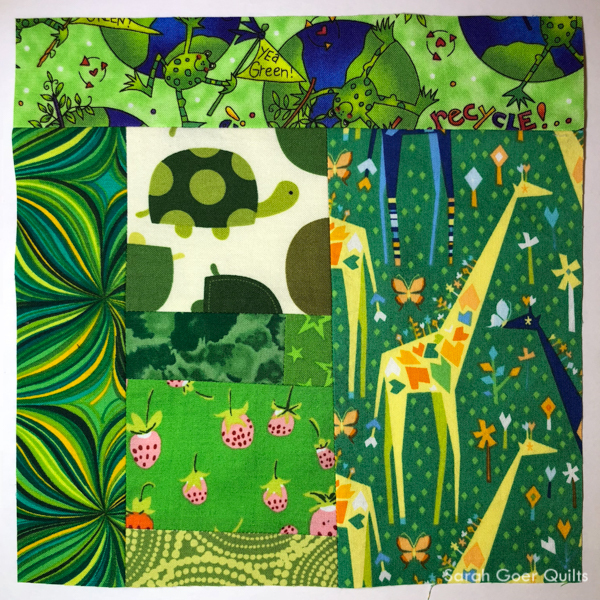 My son used that green print on the left edge in the Ocean Quilt he made for my daughter and the turtles are on the back of his first quilt, Jungle of Animals. Scrap projects are full of memories. Posted in Quilting. Tags: green, orange, scrap sewing, sewing with kids, yellow on December 4, 2018 by sarah. I really appreciate how you help facilitate sewing with your son and daughter. I also think it is awesome that your son is so comfortable with improvisation! Great looking blocks. Those giraffes are adorable. Have fun sewing together. Thank you, Anja. I wonder what color he'll pick next.